I've seen Saint Jack before on DVD, but when I saw that the National Museum of Singapore was packaging a special screening of the film with a bus tour by Saint Jack expert Ben Slater (who also happens to be a friend of mine), I knew I had to be there. The film screening and bus tour was part of the museum's 'Once Upon a Time in the Orient' film programme, which features films that were shot on location in Singapore from the 1940s and the 1970s. Saint Jack's story is a little more sordid than most: based on a Paul Theroux novel of the same name (Theroux taught for a few years at the then University of Singapore), it's about an American pimp who traffics in the seedier offerings of Singapore. The film was shot here under the pretense of a fake film synopsis because its producers suspected that the Singapore authorities wouldn't be too keen on a Hollywood depiction of a Singapore full of cheap whores, two-bit gangsters and (the worst sin of all, surely) people who don't speak proper English. They were right: the film was banned in Singapore after it was released in 1980; the ban was lifted only in 2006. As a Singaporean who barely remembers the landscapes captured in Saint Jack, watching the film again but on the big screen made it oddly more endearing and made the landscape come alive more than from watching it on DVD. Saint Jack's Singapore is a real character, as touchable as any of the other folks gambolling through its frames. Perhaps most refreshingly, it's a place where the streets were full of unscripted activity --- where anything seems possible. Later, on the bus tour, I was surprised to notice that in our swanky coach of 45 passengers, excluding the handful of Saint Jack cast and crew members everyone else was either Caucasian (hence I assume foreign) or in their 20s or 30s. So when Ben was in the middle of his commentary recounting where a certain place used to be or how a building went through different incarnations (for example, the post office shown in the film is in the Fullerton Building, now the Fullerton Hotel), there really wasn't anyone on the bus other who might remember the place, other than the film cast and crew. 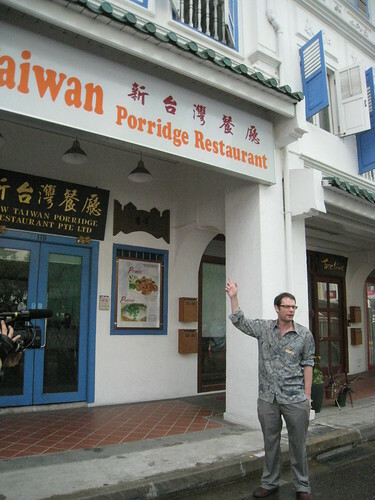 (Ben himself wasn't living in Singapore in 1978, when the film was made.) So there we were, sitting in a really nice coach and being driven all over the downtown area, and all I could feel was a profound sense of disconnected history and lost landscapes.